After you destroy some of Vah Ruta's projectiles, Sidon will swim beside one of the waterfalls pouring out of Vah Ruta. 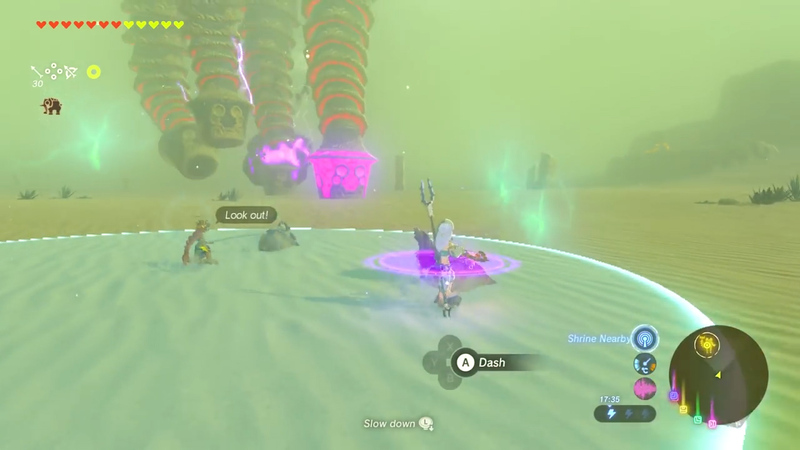 You can then use your Zora Armor to swim up the waterfall and into the air . Or perhaps Vah Naboris could send its lightning to the battlefield, with a large glowing sphere appearing that opponents have to try to escape before they get blasted. Either of these would be pretty fitting and feature abilities that are clearly demonstrated in Breath of the Wild. There is a chest in Vah Rudania that I can't work out how you're supposed to access. It's the one in the front left leg, and it's behind a locked door, I can't see any sconces near it that could open it, nor does it open when the are is flipped, so how in the hell are you meant to get to the chest? ?